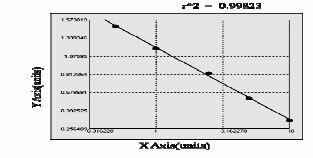 This assay has high sensitivity and excellent specificity for detection of COL11alpha2. No significant cross-reactivity or interference between COL11alpha2 and analogues was observed. NOTE: Limited by current skills and knowledge, it is impossible for us to complete the cross-reactivity detection between COL11alpha2 and all the analogues, therefore, cross reaction may still exist in some cases. Small volumes of COL11A2 elisa kit vial(s) may occasionally become entrapped in the seal of the product vial during shipment and storage. If necessary, briefly centrifuge the vial on a tabletop centrifuge to dislodge any liquid in the container`s cap. Certain products may require to ship with dry ice and additional dry ice fee may apply. MBS7252687 is a ready-to-use microwell, strip plate ELISA (enzyme-linked immunosorbent assay) Kit for analyzing the presence of the Collagen alpha-2 (XI) chain (COL11A2) ELISA Kit target analytes in biological samples. The concentration gradients of the kit standards or positive controls render a theoretical kit detection range in biological research samples containing COL11A2. The ELISA analytical biochemical technique of the MBS7252687 kit is based on COL11A2 antibody-COL11A2 antigen interactions (immunosorbency) and an HRP colorimetric detection system to detect COL11A2 antigen targets in samples. The ELISA Kit is designed to detect native, not recombinant, COL11A2. Appropriate sample types may include undiluted body fluids and/or tissue homogenates, secretions. Quality control assays assessing reproducibility identified the intra-assay CV (%) and inter-assay CV(%). Intended Uses: This COL11alpha2 ELISA kit is a 1.5 hour solid-phase ELISA designed for the quantitative determination of Rabbit COL11alpha2. This ELISA kit for research use only, not for therapeutic or diagnostic applications! Principle of the Assay: COL11alpha2 ELISA kit applies the competitive enzyme immunoassay technique utilizing a monoclonal anti-COL11alpha2 antibody and an COL11 alpha2-HRP conjugate. The assay sample and buffer are incubated together with COL11alpha2-HRP conjugate in pre-coated plate for one hour. After the incubation period, the wells are decanted and washed five times. The wells are then incubated with a substrate for HRP enzyme. The product of the enzyme-substrate reaction forms a blue colored complex. Finally, a stop solution is added to stop the reaction, which will then turn the solution yellow. The intensity of color is measured spectrophotometrically at 450nm in a microplate reader. The intensity of the color is inversely proportional to the COL11alpha2 concentration since COL11alpha2 from samples and COL11 alpha2-HRP conjugate compete for the anti-COL11alpha2 antibody binding site. Since the number of sites is limited, as more sites are occupied by COL11 alpha2 from the sample, fewer sites are left to bind COL11alpha2-HRP conjugate. A standard curve is plotted relating the intensity of the color (O.D.) to the concentration of standards. The COL11alpha2 concentration in each sample is interpolated from this standard curve. NCBI/Uniprot data below describe general gene information for COL11A2. It may not necessarily be applicable to this product. COL1A2: Type I collagen is a member of group I collagen (fibrillar forming collagen). Defects in COL1A2 are the cause of Ehlers-Danlos syndrome type 7B (EDS7B). EDS is a connective tissue disorder characterized by hyperextensible skin, atrophic cutaneous scars due to tissue fragility and joint hyperlaxity. EDS7B is marked by bilateral congenital hip dislocation, hyperlaxity of the joints, and recurrent partial dislocations. Defects in COL1A2 are a cause of osteogenesis imperfecta type 1 (OI1). A dominantly inherited connective tissue disorder characterized by bone fragility and blue sclerae. Osteogenesis imperfecta type 1 is non-deforming with normal height or mild short stature, and no dentinogenesis imperfecta. Defects in COL1A2 are a cause of osteogenesis imperfecta type 2 (OI2); also known as osteogenesis imperfecta congenita (OIC) or lethal perinatal. A connective tissue disorder characterized by bone fragility, with many perinatal fractures, severe bowing of long bones, undermineralization, and death in the perinatal period due to respiratory insufficiency. Defects in COL1A2 are the cause of Ehlers-Danlos syndrome autosomal recessive cardiac valvular form (EDSCV). A connective tissue disorder characterized by hyperextensible skin, atrophic cutaneous scars due to tissue fragility and joint hyperlaxity. In addition to joint laxity, skin hyperextensibility and friability, and abnormal scar formation, patients have mitral valve prolapse and insufficiency, mitral regurgitation, and aortic insufficiency. Defects in COL1A2 are a cause of osteogenesis imperfecta type 3 (OI3). A connective tissue disorder characterized by progressively deforming bones, very short stature, a triangular face, severe scoliosis, grayish sclera, and dentinogenesis imperfecta. Defects in COL1A2 are a cause of osteogenesis imperfecta type 4 (OI4); also known as osteogenesis imperfecta with normal sclerae. A connective tissue disorder characterized by moderately short stature, mild to moderate scoliosis, grayish or white sclera and dentinogenesis imperfecta. A chromosomal aberration involving COL1A2 may be a cause of lipoblastomas, which are benign tumors resulting from transformation of adipocytes, usually diagnosed in children. Translocation t(7;8)(p22;q13) with PLAG1. Belongs to the fibrillar collagen family. 1. this study highlights an essential role for Sin3B in IFN-c induced COL1A2 repression in smooth muscle cells.